Safe injections sites are not a new idea, globally, and have been saving the lives of intravenous (IV) drug users in other nations for decades at more than 120 sites. This summer, this new revolution has plans to infiltrate the United States in an effort to help reduce the more than 65,000 deaths caused by drug overdose and the number of calls placed to law enforcement and emergency medical services daily. The idea has been proposed and rejected over the years in various places, and has finally been approved in a number of major US cities including San Francisco, New York City, Philadelphia, and Denver. Several of these locations across the United States have opened safe injection sites this year, and more plan to follow suit soon. A safe injection site (SIS), also known as supervised injection facilities (SIFs), sanitary consumption facilities (SCFs), and drug consumption rooms (DCRs), are essentially facilities where healthcare personnel can professionally supervise IV drug use. The theory behind the establishment of these facilities is to make IV drug use safer for users and society. Without access to an SIS, IV drug users tend to use unsafe techniques and equipment to inject the drug and dispose of the needles in unsafe manners. This causes public exposure to the drug use as well as a host of communicable diseases. Additionally, the rate of accidental overdose that results in death is much higher in communities without an SIS. SIS offer a safe place for IV drug users to inject drugs with access to clean supplies, needle disposal boxes, and access to medical oversight to reverse overdose or dangerous side effects of illicit drugs. Many sites also offer education to users about safe injection practice and other safe practices for when they use outside of the facility. So, if SIS are so beneficial, why don’t we have them popping up all over the nation? The controversy surrounding these facilities lies within the ethical concerns of whether or not these facilities condone and even encourage IV drug use within the communities they inhabit, rather than help to solve the problem that is the global drug crisis. Many fear that providing a safe place to shoot up will only exacerbate the already rising drug problem. Heroin use has risen, nationwide, by more than 70 percent within the last 10 years, with no signs of slowing. So, although SIS provides a safe place to use, will it help reduce use? Another ethical concern is for the medical professionals that work at the sites who are responsible for the supervision of the drug use. Does this completely contradict the oath that their career is based upon? And, some fear it puts a lot of responsibility on the medical professionals — they are unable to confirm the quality or the safety of the drug used. SIS is taking needle exchange programs one step further. Is SIS one step from becoming a facility that provides the drug to ensure it is pure and requesting the medical professionals to dose it out? Then, of course there are the legal and financial arguments surrounding SIS. A safe place means that those who use the facility do not have to worry about law enforcement intervention and most people believe this is a loophole around drug laws. While this benefit is meant to encourage users to do so in a clean, safe facility, many fear that it will be exploited to dodge arrest. Additionally, the funding for these facilities is a hotly contested topic, although it varies from site to site. One of the biggest concerns surrounding the use of SIS is whether or not it is in the best interest of the IV drug user. Providing a safe environment with access to sterile supplies and life-saving medical interventions may seem like it is in the best interest of the user, but many argue that the user would be better served if rehab was made more accessible instead. Instead of making the unhealthy act safe, many argue that a solution should be provided to correct the unsafe practice instead. The overarching argument seems to be that saving lives outweighs any of the risks or downsides that these facilities present. Important steps to drug addiction recovery and rehab include removing the addictive substance from the addict’s life to reduce temptation and encourage sober living. With access to SIS, a former addict has a site full of users with access to their substance of choice. Rather than helping addicts recover, safe injection sites offer a known location with access to fellow users. SIS are meant to be a place free from judgment and consequence, offering only a clean, safe place to use IV drugs. This accepting environment may cause confusion and be interpreted as implying that drug use is acceptable, which is counterproductive to encouraging addicts to seek help and overcome their addictions. 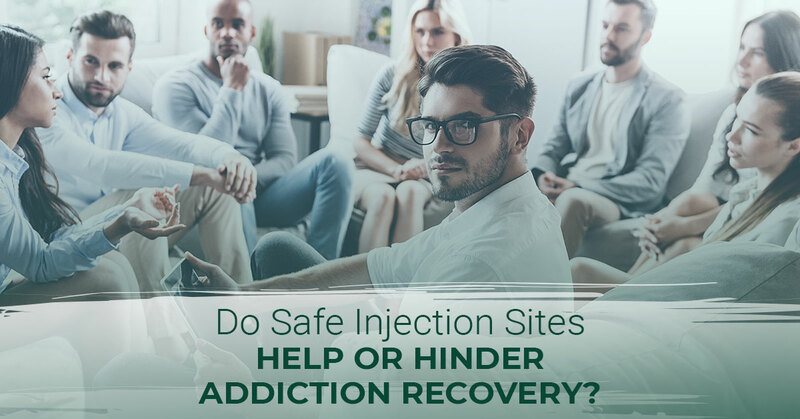 Addicts and IV drug users who utilize the services of an SIS have already expressed their desire to use more safely, which indicates a desire to live and a concern for their health, for themselves and those around them. One of the ugly truths about drug abuse and addiction is that many addicts do not want to be addicts and would choose to live a healthy, sober life if they thought it was possible. Many drugs, although used voluntarily the first time, force a strong, relentless grip on their victims. Heroin, especially, is so addictive that even a single recreational use at a casual party can lead to a lifelong battle with addiction. When a safe injection site offers education about drugs, drug use, and an escape option, users who visit the site may be more likely to take advantage of the recovery options presented by clinic staff. The verdict is still out as to whether safe injection sites will help or hinder the efforts to provide addiction recovery to as many drug users as possible and help win the war on drugs. However, with 13 locations due to open across the United States in the very near future, results will soon be known. At Metropolitan Rehabilitation Center in Oak Park, we are dedicated to helping rid Detroit of its drug problem that robs too many of our residents of their lives. We offer inpatient and outpatient drug and alcohol rehab services. If you or someone you know is struggling with addiction, contact us to learn more about treatment options and safe alternatives to drug use. Start your journey to sobriety at Metro Rehab.